Alderson’s shop was just a bit further on from that of Charles Snelling, perfumer and hair dresser, at number 13. The houses were very similar, but Alderson’s did not have the columns and architrave that Snelling’s property had. For the position of the house in what is now Borough High Street, see the post on Snelling. The Aldersons had not always been at number 13, as Kent’s Directory of 1823 testifies. In that year, William Alderson, tailor and draper, can be found at 313 Borough and 5 Piccadilly. 313 Borough is, according to Horwood’s 1799 map, closer to London Bridge than 13 Wellington Street. Although the name of William Alderson is mentioned in Kent’s Directory, it was no longer William himself who ran the business as he had died in July 1816. (1) The Alderson’s shop had been at number 313 since at least 1808 when William’s name can be found in the land tax records. 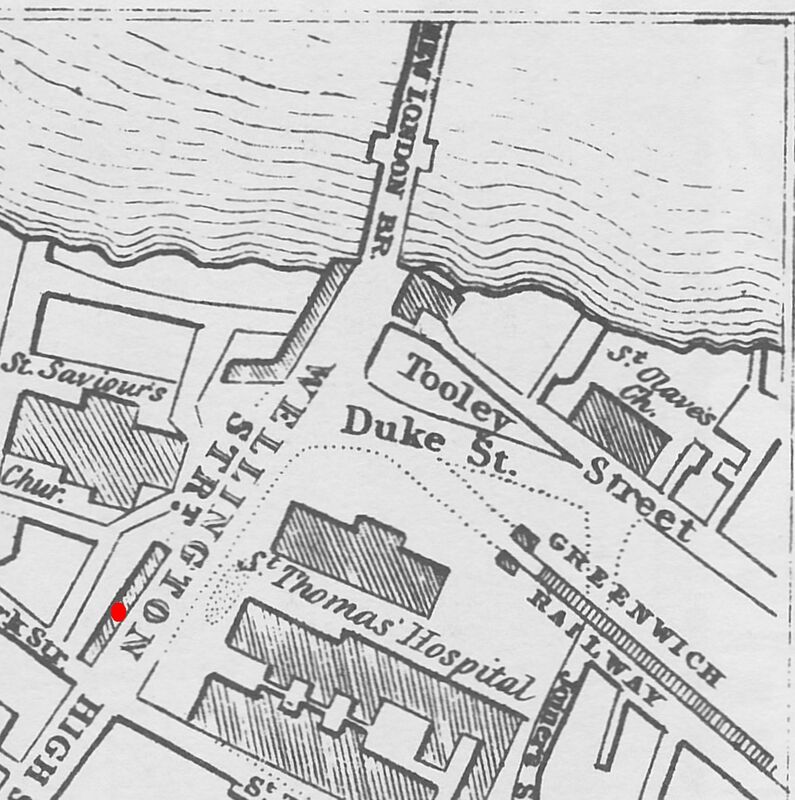 The land on which the house stood was the property of St. Thomas’s Hospital. George must have moved again as he was later to be found at 13 Wellington Street, not just in the Tallis Street View, but also in Pigot’s Directory of 1839. In this directory he is listed as a tailor but with a * in front of his name to indicate that he was also a draper. His father’s will did not only give George a share in the business, but also three freehold houses at Barnard Castle, Durham. And this is were this story links to an email I had about an Edmund Alderson who died at Queen’s Row, Pentonville, and left bequests to his two brothers in the Yorkshire Dales. Unfortunately, I cannot link the Alderson tailors on the south side of the Thames to an Edmund, but according to my correspondent, there is a group of family history people looking into the Aldersons from the north of England with links to London, so perhaps one day …. George Alderson, the tailor, was baptised at Barnard Castle on 20 October 1780 as the son of William and Martha. From the 1841 census we know that George married an Ann, and a possible candidate is Ann Horker (or Harkes). That marriage was conducted in April 1807 at St. Giles, Cripplegate. One of the witnesses was Martha Alderson which could either be George’s mother or his sister. In 1810, a daughter Ann is baptised at St. Saviour’s and father George is clearly given the occupation of tailor, so we know that he is the correct George. The next child, William Aeneas, is baptised at St. James, Piccadilly on 8 March 1813 which suggests that George was running his father’s shop at Piccadilly at that time, but in 1817, when son George junior is baptised, he is back in Southwark, apparently never to leave it again. William Aeneas dies in February 1850 and father George in December 1850, 71 years old. In his very short will he leaves everything to his wife whom he also names as the sole executor. (4) It is a pity that he did not specify a few bequests as we might have found out whether he still had property in Barnard Castle, but alas. The 1851 Post Office Directory still mentions George & Son at 13 Wellington Street, but the 1851 census shows widow Ann there as woollen draper with daughter Eliza. The 1851 census also tells us that Ann was born in Barnard Castle, just as her husband had been. 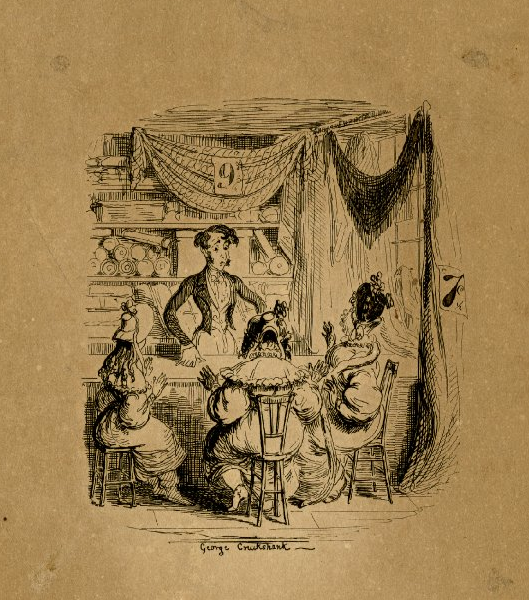 Mother and daughter must have kept the shop going throughout the 1850s as the name of G. Alderson can be found in the land tax records until 1862, but in 1863, the tax records suddenly show a big cross drawn across the page. The record for 1864 explains why; the Charing Cross Railway Company had bought up all the land in the area in order to be able to build the viaduct over the High Street which was to take their railway from London Bridge to Charing Cross and Cannon Street. And that is as far as I can take the history of the shop as the building disappeared under the viaduct and I have not been able to trace Ann and Eliza to their new home. (1) He was buried at St. Saviour’s, Southwark, on 19 July 1816. (3) Corporation of London Records, CLA/022/04/038/9acd. You may also like to read about Todd & Procter, cheesemongers, who also came from the Barnard Castle area (see comment below). To explain some of the family history of the Edgingtons, we have to look at an 1864 court case Edgington v. Edgington in which Benjamin Edgington accused the defendant of falsely representing himself as in succession to or in connection with him. (1) He also accused him of opening a letter addressed to him, answering it in his own name in order to gain the custom of the letter writer. 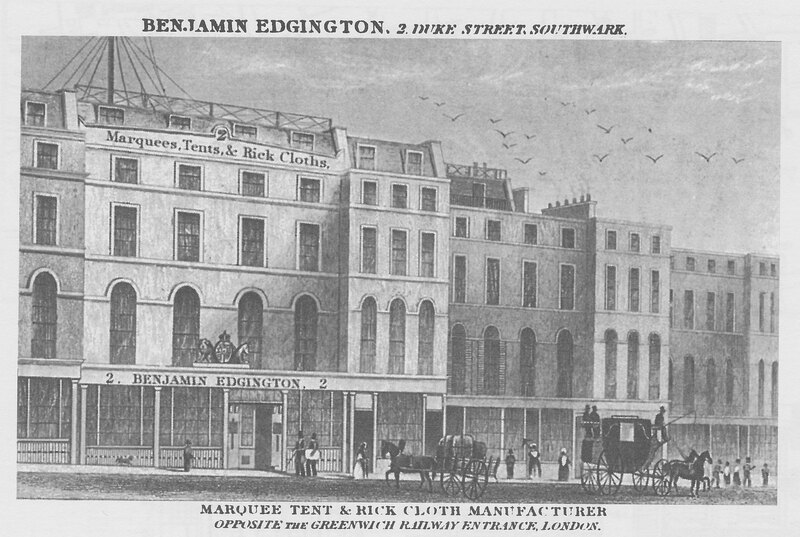 Benjamin stated that he had been in partnership with his brother Thomas as marquee makers up to 1823 when they dissolved the partnership. (2) Benjamin carried on the business under his own name, Thomas as Thomas Edgington and Co., and the latter’s son as John Edgington and Co. Although only indirectly stated in the report of the case, the defendant of the court case was not Thomas senior, who had died in 1857, but possibly his son John Farncombe, although more likely Thomas Farncombe, the other son of Thomas who took over after his father’s death. Thomas senior had his shop at 17 Smithfield Bars and John had his place of business on the Old Kent Road, but probably combined the two again after the death of Thomas senior and junior. 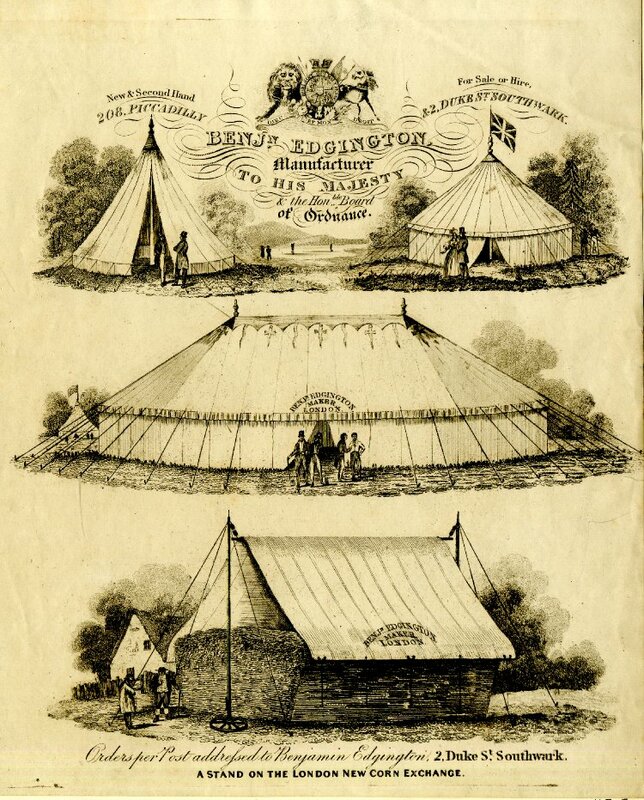 It does not help that the various Edgingtons all seem to work in the tarpaulin, marquee and tent business, although not all had addresses within the scope of the Tallis Street Views, so can be safely ignored for the purpose of this blog. Back to the court case. 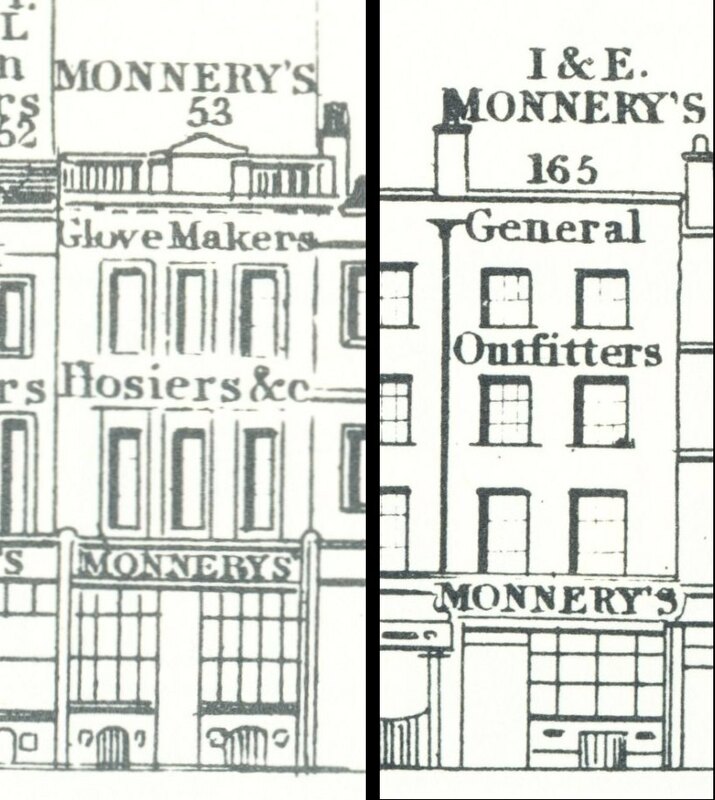 Benjamin states that until 1853 he had his shop at 208 Piccadilly [on the right in the elevation at the top of this post], then moved to 32 Charing Cross where he remained until 1861 when he left for Duke Street [corner of Wellington Street, Borough; on the left in the elevation]. 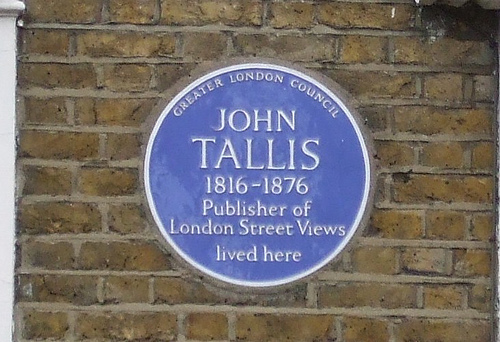 This is slightly ambiguous, as we know from the Tallis Street views that he already had the shop in Duke Street since at least 1839 (in fact, since 1834 or 1835), but he probably meant that he gave up his other shop and just concentrated his activities in Duke Street. Benjamin alleged that soon after he left the Piccadilly premises, the defendant made an arrangement with the owner of 18 Piccadilly, almost opposite number 208, to take in his letters and receive commissions and that when Benjamin left Charing Cross, he did the same with the owner of 5 Charing Cross. The defendant disputed this and said he had only made arrangements in Piccadilly 8 years after Benjamin had left and that he had only supplied the owner of 5 Charing Cross with goods and was not trading from there. The allegation that he pretended to be Benjamin’s successor could not be substantiated. The only case that could be proven was the opening of the letter from the Master of Trinity College, Cambridge, about the erection of a marquee for the visit of the Prince of Wales to the College. The defendant alleged that the address had been indistinctly written (he had conveniently destroyed the envelope) and besides, he had received wrongly addressed letters before. He had, to add to the confusion, sent his manager, who had previously worked for Benjamin, to Cambridge, leaving the Master under the wrong impression that Thomas (or John) had taken over Benjamin’s business. That mistake had been corrected and the Cambridge order had gone to Benjamin. The outcome of the whole procedure was that deliberate impersonation and misrepresentation could not be proven, but the defendant was urged to be more careful with the correspondence, especially as wrongly addressed letters had been received by him before, so he should have been aware of the possibility that they were not meant for him. In an advertisement in the Bury and Norwich Post of 20 May, 1835, Benjamin “begs to inform his friends and the public, [that] he has removed from 5, Tooley Street, to No. 2 Duke Street”. This was the direct result of the building of the new London Bridge. In 1829, Benjamin had heard that this new bridge was to be built and he realised that the new structure would obscure his Tooley Street premises from view, which would negatively affect his business. He complained directly to the Lord Mayor with a petition and claimed damages. 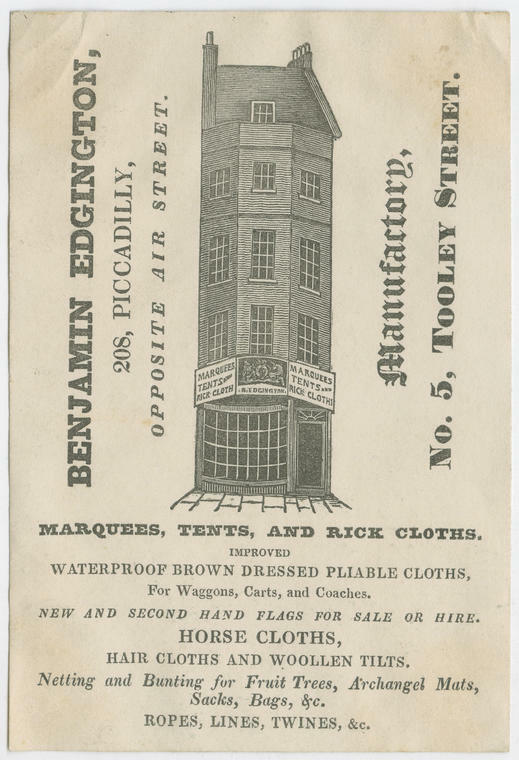 He was able to convince the Mayor and City Corporation of his case and was awarded the lease on 2 Duke Street.5 From the 1835 advertisement, we also learn that Benjamin deals in rick clothes, poles, pullies, waterproof cloths for waggons, sacks, ropes, tarpaulins, etc. Later advertisements single out his marquees that are bigger and better than any the competition can deliver. His ‘Royal Victoria’ has a boarded floor for dancing and 8,000 people can stand in it, or 1,000 can be seated, for instance at a dinner. The marquee can be hired “at the shortest notice”. 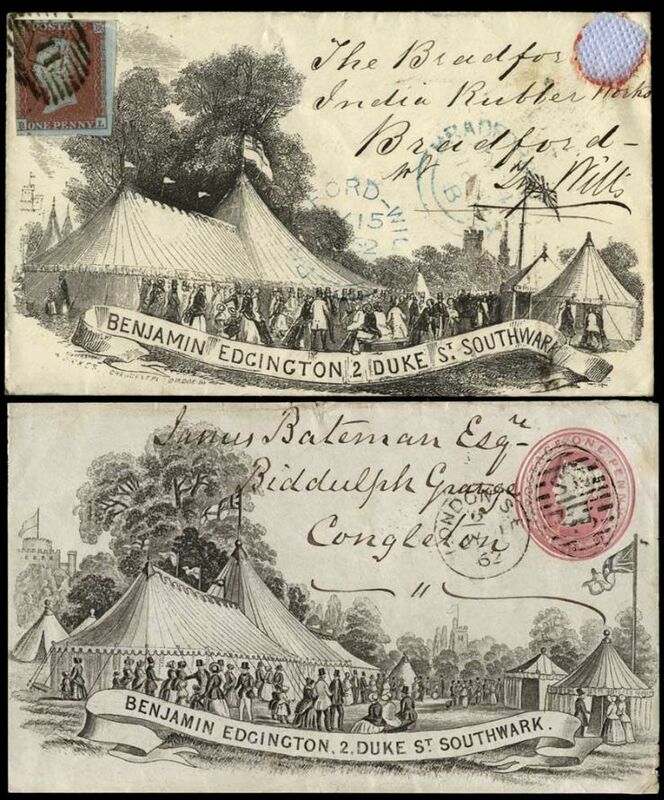 (6) That it was not an idle boast, can be deduced from the report of a “sumptious entertainment” given by the Duke and Duchess of Somerset to the Queen which included one of Benjamin’s marquees. “A table was spread for the Royal party in the dining-room, and an immense marquee was erected at the end of the portico, capable of containing the whole assembly with ease. After dinner the tent was cleared for dancing, and its grand and striking appearance can only be faintly imagined by stating its dimensions. These were – 180 feet long, 40 feet wide, 35 feet high, with a dome 53 feet diameter, and 50 feet high”. (7) It must have been some party. Benjamin himself died in September 1869(8), but the business was continued, first under the continuing management of William Hardcastle who started his career as an apprentice to Benjamin’s father, but stayed on after his term to become the trusted employee and friend of Benjamin. He married Benjamin’s sister Maria on 23 Jun 1817 at Saint Mary’s, Reading. By the time he took over the firm, Hardcastle himself was getting on and the management devolved to the three sons of one of Benjamin’s other sisters, Sarah Williams. 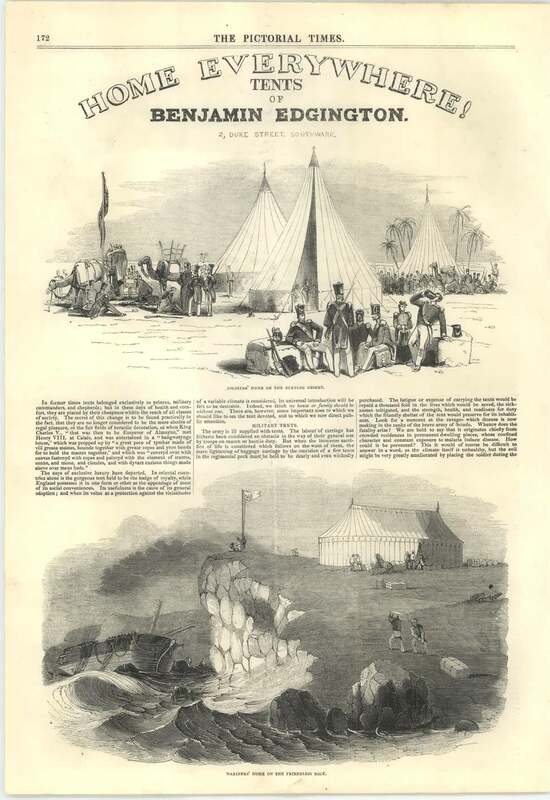 (9) The firm was to continue under Benjamin’s name for many years to come, supplying an ever-increasing range of camping requirements to travellers, settlers, explorers, emigrants and the military. At some point, the firm liaised with S.W. Silver who specialised in clothing and furniture for travellers. They do not seem to have entered into a formal partnership, but pooled resources and advertised together, sometimes with the emphasis on clothing and then the address for Silver would be given, sometimes with the emphasis on the equipment and then the Edgington address would be given. 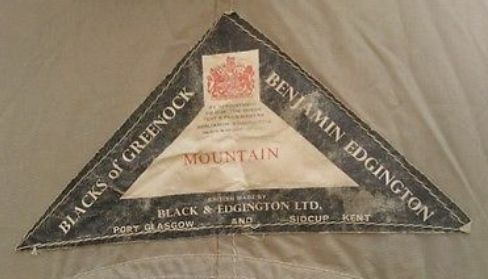 In 1967, Benjamin Edgington Ltd was taken over by Thomas Black & Sons, which are now Black’s of Greenock. 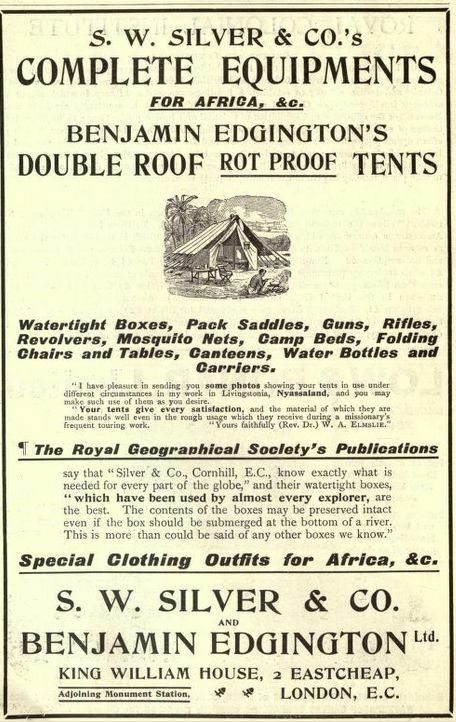 Below a selection of advertisements and trade cards for Benjamin Edgington. Grateful thanks go to Charles E. Alexander who kindly sent me his notes on the family. For more Edgingtons, see the post for Thomas Edgington of 17 Smithfield Bars. (1) The Law Times, vol. XI, pp. 299-301. (2) Official notice of termination partnership to be found The London Gazette, 4 January 1823. They are then called sack-cloth and tarpaulin manufacturers and worked from Tooley Street, Southwark. (3) The will is dated 8 December 1827 (PROB 11/1737/307) and she is buried on 12 January 1828 at St. John’s, Hackney. Probate is granted 17 March. (4) Charles Nattali 1831, Stella Sophia 1832, Sarah Ann 1834, Helen Nattali 1836, Emily 1838, Elizabeth Atkinson 1840, and Susanna Jane Francis 1842. (5) Information on the reasons behind the move received from Charles E. Alexander. (6) The Brighton Patriot, 26 September 1837. (7) The Morning Chronicle, 31 July 1839. (8) England & Wales, National Probate Calendar (Index of Wills and Administrations ), 1869. Probate was granted on 17 September 1869 to Maria Theresa, the widow, Charles Nattali, the son, Samuel Bourne, the husband of daughter Sarah Ann and William Hardcastle of 2 Duke Street (the manager of the firm). (9) Information on the later management received from Charles E. Alexander. In June 1792, the partnership between Josiah Monnery and his sons, Josiah junior and William, of the Borough of Southwark, was dissolved by mutual consent. 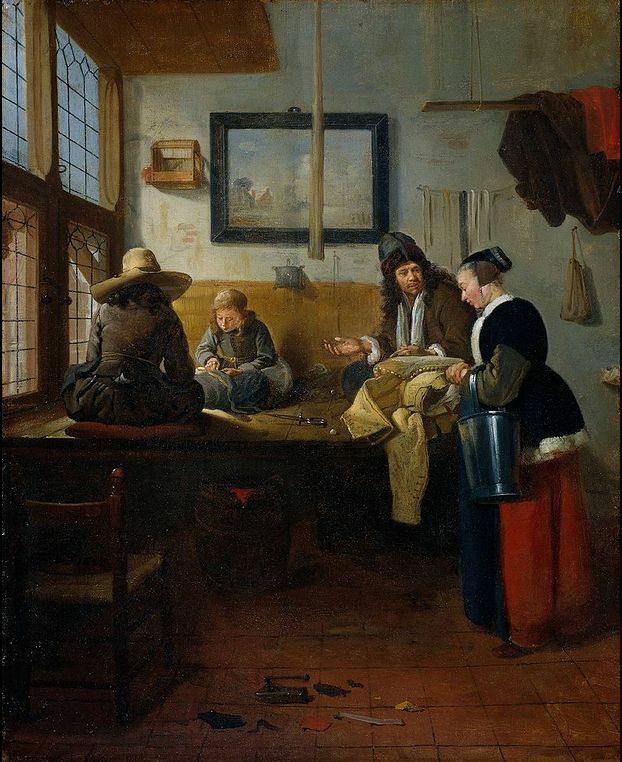 (1) The Monnerys were leather-sellers and glovers and received their leather from all over the country. In 1804, a newspaper reported on a case tried at the assizes of York where one Mr. Smith had sued the Aire and Calder Navigation Company because his goods had not been delivered to Monnery. Apparently, Smith had delivered a bale of leather to the warehouse of the Navigation Company at Leeds from where it had duly been taken to Selby where it was transferred to another ship bound for London. Aire and Calder defended themselves by claiming to be carriers from Leeds to Selby and that they had only been paid for bringing the parcel to Selby. They did not think they could be held accountable for the actions of another carrier who took the goods further on its route. The judge agreed with the defendants and did not see why the first carrier should be accountable for a parcel that might be brought halfway round the globe by various carriers. The case was not brought before a jury but dismissed as “non-suited”. (2) What happened to the parcel and whether Monnery ever received the leather from Leeds remains untold. In 1824, William’s son Edward Josiah is apprenticed to William Willmott, a painter-stainer. Why a painter-stainer? Possibly because the leather for the gloves needed to be dyed in various colours? Whatever the reason for this choice, Edward Josiah is taken into his father’s business after his apprenticeship. 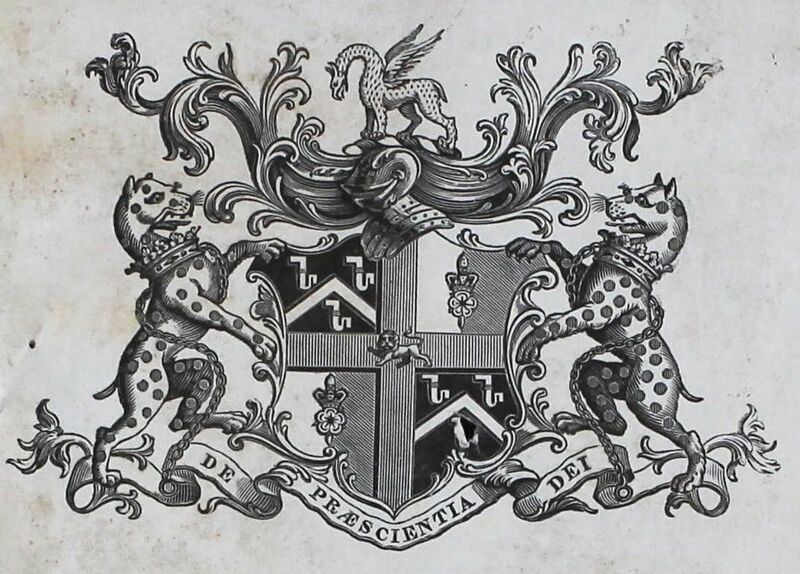 In February 1830, the insurance on the business is still in Josiah and William’s name, but by August 1832, it is listed under JW and EJ Monnery; that is: John William (born ±1802) and Edward Josiah (born ±1810), the two sons of William. William himself takes out an insurance on 9 Trinity Dover Road, but confusingly, another entry of the Sun Fire Office for the same date lists William, John William, Edward Josiah and one Francis Child as the occupants of 53 Borough High Street. The 1836 entry just lists them as Messrs. Monnery, so that is no help, but in 1837, the brothers have apparently branched out with John William still at Borough and Edward Josiah at 165 Fenchurch Street. 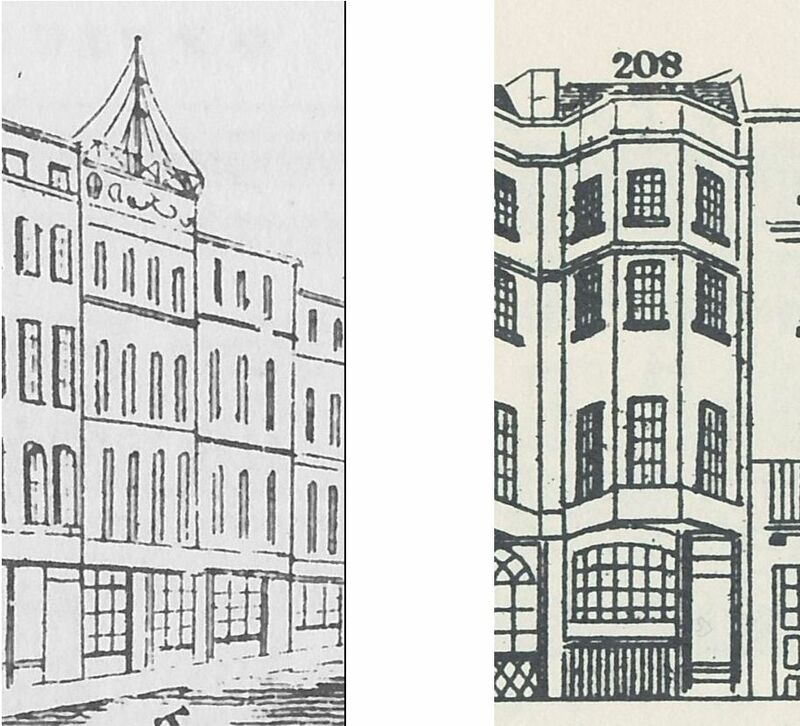 Well …, not quite, as two other entries for 1837 give both JW and EJ at 53 Borough and at 165 Fenchurch Street. The apparent confusion is probably caused by separate insurance policies for the business and the living quarters, but unfortunately the online catalogue of the National Archives does not give such details. What is clear, is that JW and EJ are still in business together as in an 1838 advertisement where “J. and E. Monnery beg to call the attention of the public to their outfitting warehouses, 165, Fenchurch-street, and 53, High-street, Borough, where a large assortment of every article requisite for a voyage to … the Indies and Colonies is kept ready for immediate use”. (3) Please note the change from leather-sellers and glovers to outfitters. Not that they gave up their former occupation as they are still called “hosiers, glovers and out-fitters” by their shopman who gave evidence against a thief who stole some handkerchiefs from the Fenchurch shop. (4) EJ is also called to give evidence in that trial and from him we learn that he does indeed live above the shop and that he is in partnership with his brother who does, however, not live there. One of the Monnerys had a serious accident on Ben Nevis, but which one is unfortunately not revealed in the newspaper that reported on the accident. The party left Fort William early in the morning to climb the mountain which was successfully accomplished with the reward of breath-taking views on the top. But 400 yards into the descend, Monnery was walking a little behind the others and when the guide happened to be looking round, he saw Monnery fall and dash his head against a large stone. They brought him to a small stream where they washed the wound and dressed it with a handkerchief. They managed to carry him halfway down where a mountain pony could take over the rescue. He was brought to the Queens’s Hotel where the doctor stitched up the wound and pronounced his skull not fractured. Although Monnery had intended to go on to Inverness, that was not possible and he had to stay behind in Fort William. (8) What happened afterwards with the unfortunate Monnery did not get reported, but I assume he eventually made his way back to London. In 1883 the business removed to 50 Fenchurch Street and in 1893 old Edward Josiah died. Edward John and Walter, with James Gibbs, a wholesale woollen draper, were the executors. 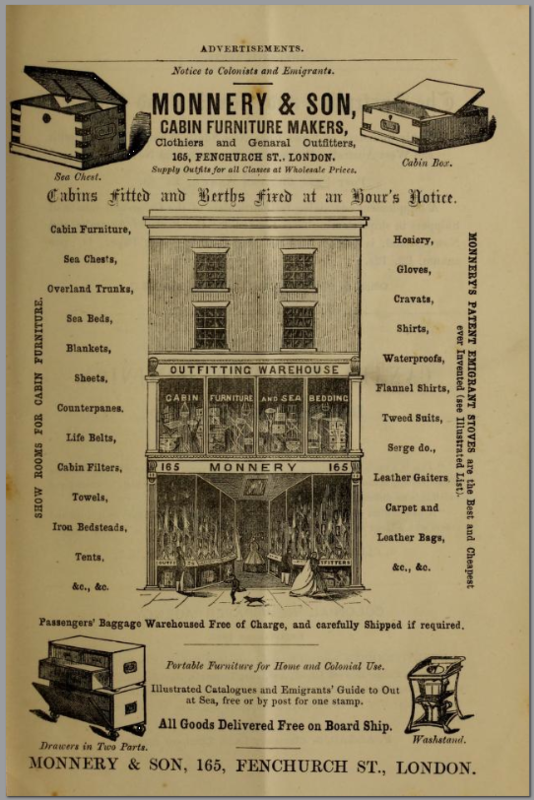 From the probate record, we also learn why the firm never became Monnery & sons (plural); Walter has become an iron merchant, rather than join his brother in the outfitting firm. (9) Edward John died in 1904 with probate granted to the executors Emma Dower Monnery, the widow and – presumably the same – James Gibbs. (10) But that was not the end of the business. The Bedforshire and Luton Archives hold the papers of James E. Bridges, a naval officer and the second son of captain Sir Ernest Arthur Bridges and among them is a bill from Monnery Ltd of London and Liverpool for clothing. 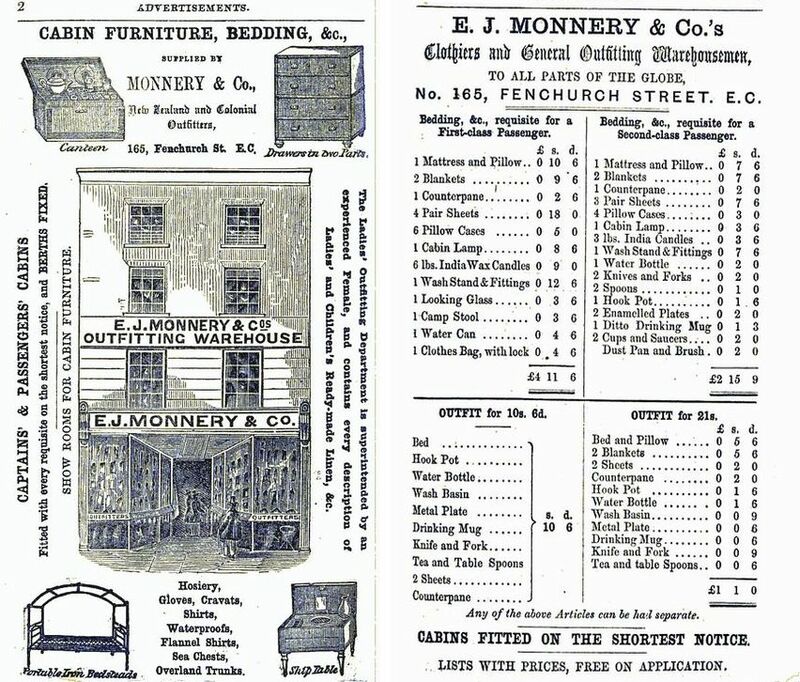 (11) How Monnery Ltd is related to the Monnerys of Fenchurch Church is unclear, but as it is not a very common name and they appear to be in the same business, I assume there must be a link. (1) London Gazette, 5 February 1793. (2) Hampshire Chronicle, 13 August 1804. (3) the Morning Chronicle, 5 April 1838. (4) Old Bailey, case against Robert Smith, 1 January 1838. (5) London Gazette, 16 August 1842. (6) Probate 13 March 1874. Executors are his brother Edward Josiah and Alfred George Roper, surgeon. (7) Old Bailey, case against William Fisher, 22 September 1862. (8) The Dundee Courier, 12 September 1864. (9) England & Wales, National Probate Calendar (Index of Wills and Administrations), 22 August 1893. (10) England & Wales, National Probate Calendar (Index of Wills and Administrations) , 29 April 1904.